I try to publish something on this blog at least once a month – and my biggest motivator is my lovely MIL who asks me regularly when my next post will be up 🙂 Even though I’ve ended up on Oct 31sh with a not very Halloween-y post, I’m glad for the inspiration from my family to keep blogging regardless of the season! For my MIL’s birthday last year (celebrated along with two other family members’ birthdays), I made my first two-tier cake. 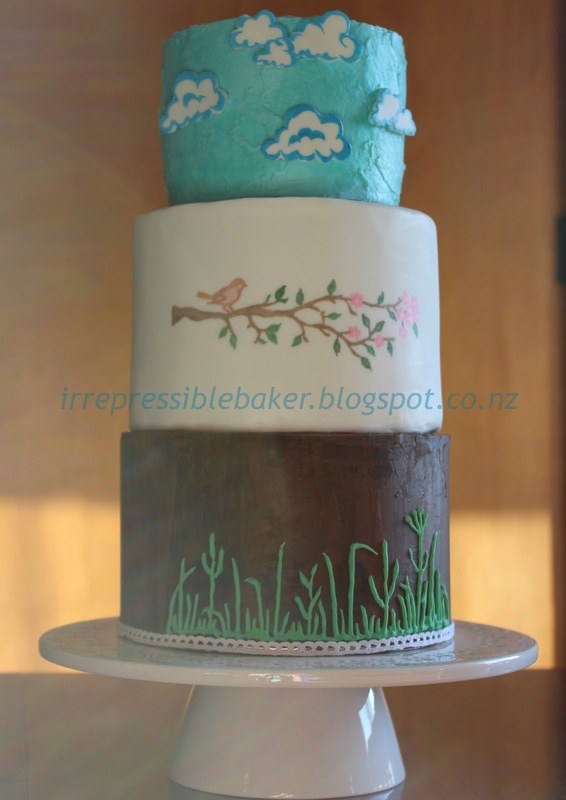 I’m pleased to say that the design for this cake was my own, with a lot of inspo from a set of craft stencils that I scored from a newsagents’ in Fairlie. 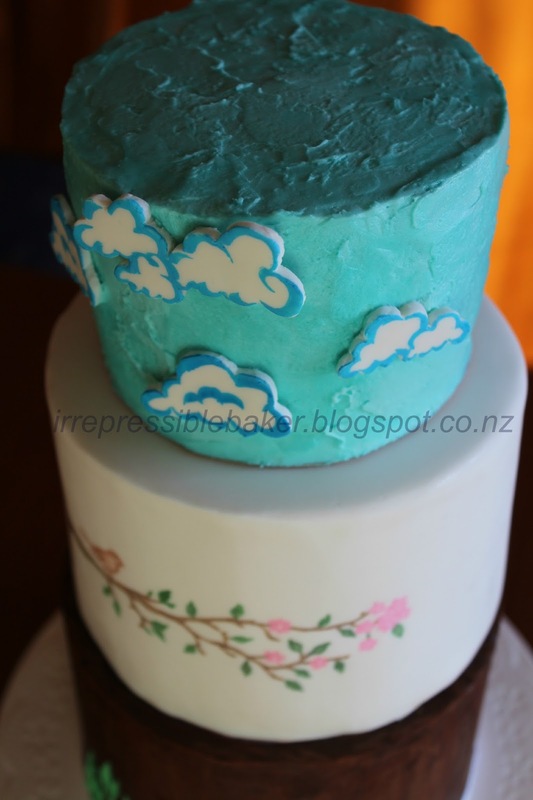 I‘ll keep the details as to-the-point as my detail-loving brain will allow: the top tier was chocolate (I think, although my notes say carrot…) with Swiss meringue filling and icing, and decorated hand-painted fondant clouds – thanks to my happy helper E! 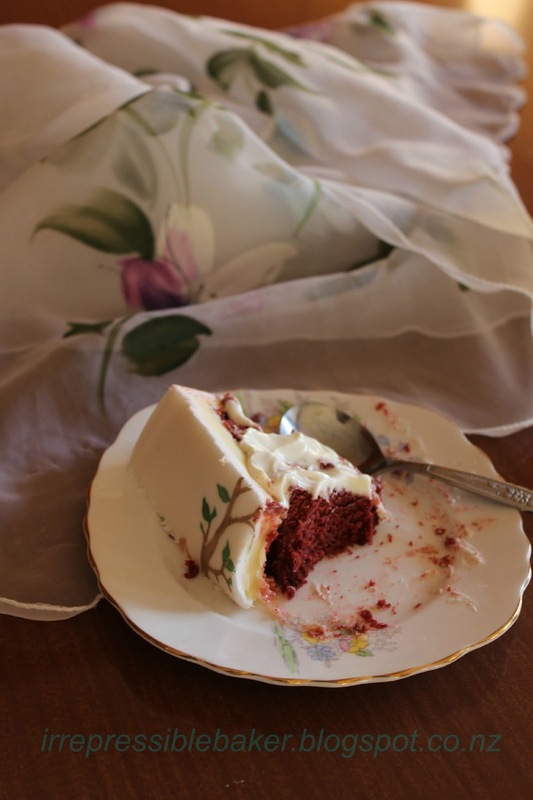 The middle tier was red velvet, poorly covered in white choc ganache – I say poorly because the red velvet leakage that ensued could have been prevented if I had been more careful and not left any gaps! 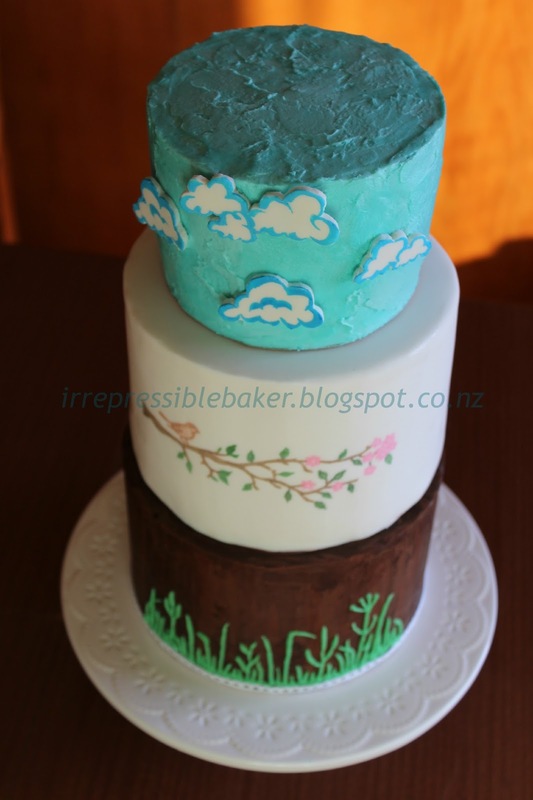 The escaped moisture also made the outer layer of fondant soft and prone to mishaping (as seen in image below)… My near-despair was topped off by my lack of consideration for the thickness of the fondant in the overall design, meaning this tier was almost the same size as the bottom tier. Well, I guess if everything was done right the first time then the world wouldn’t be such an interesting place 😉 At least the hand-painted little birdy looked happy with his outlook! 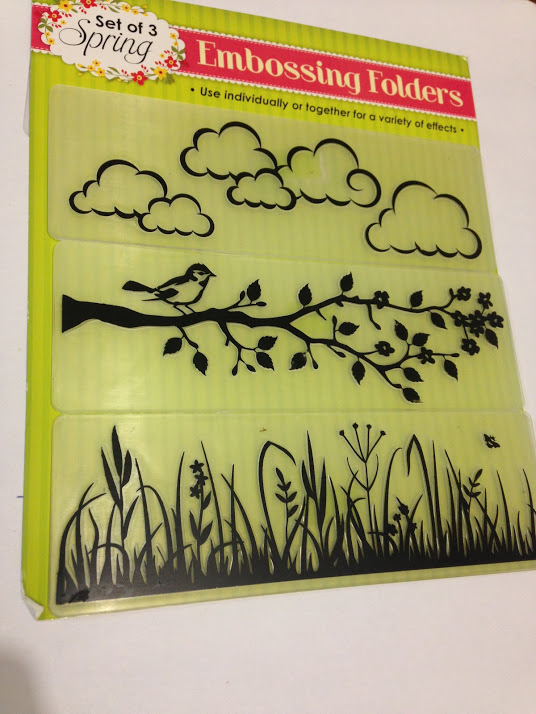 I traced the stencil design onto baking paper which I then stuck onto the fondant surface and lightly traced over to leave an indentation for painting. 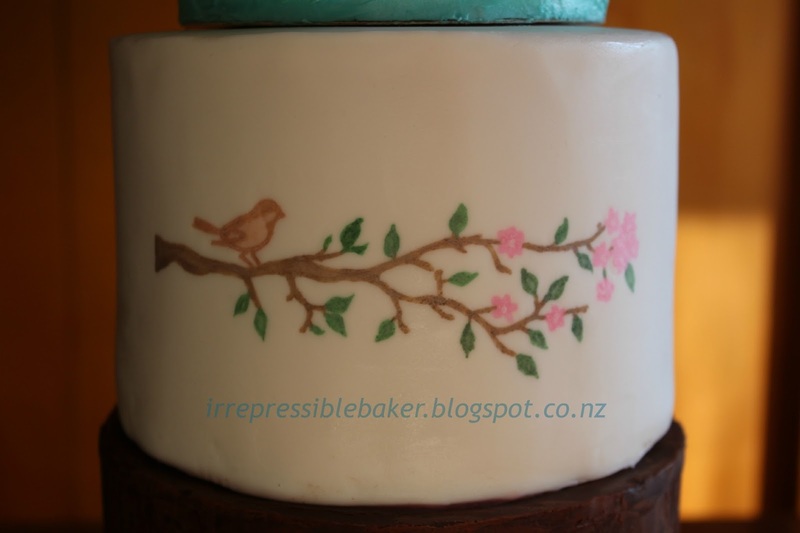 Gel paints mixed with cake decorator’s fluid did the trick to colour between the lines. 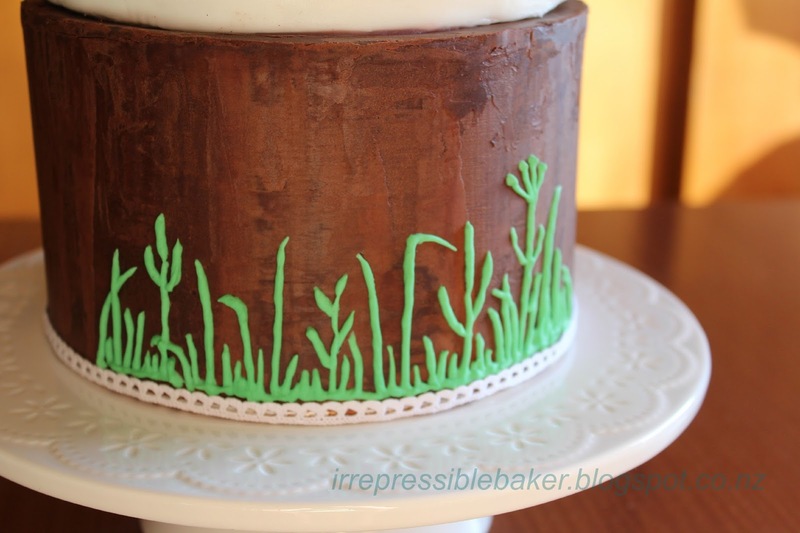 Lastly the bottom tier was made of delicious preserved ginger cake covered in chocolate ganache with green grass done with royal icing (by eye). Whew! It was a big effort, and the unseasonably hot weather on the day of the birthdays celebration was an unexpected challenge for the buttercream to keep its shape. 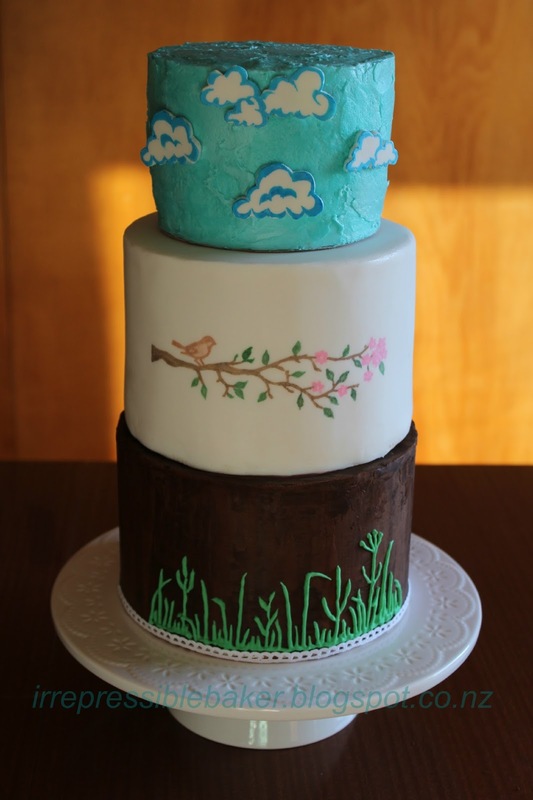 But sunshine like that and a cake like this, how could we not have been hopeful for an early spring? !